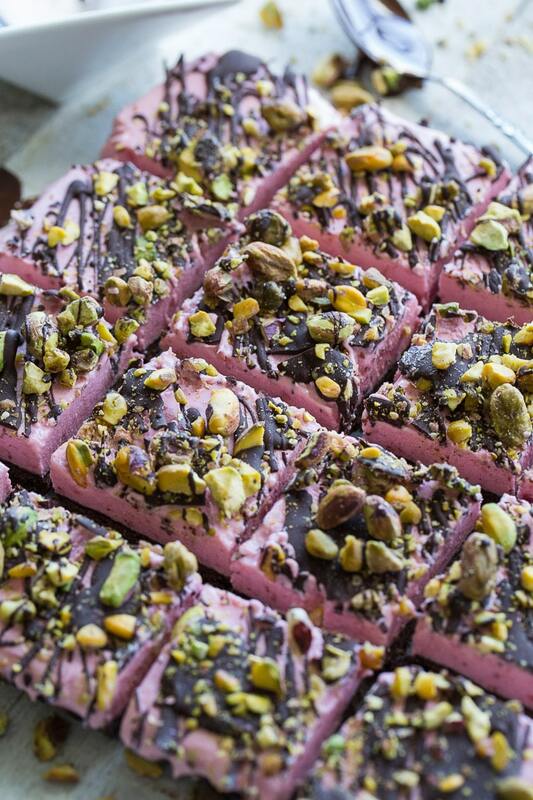 Frozen Strawberry Goat Cheese Bars! This is the gluten-free, healthy-ish summer treat you need in your life! 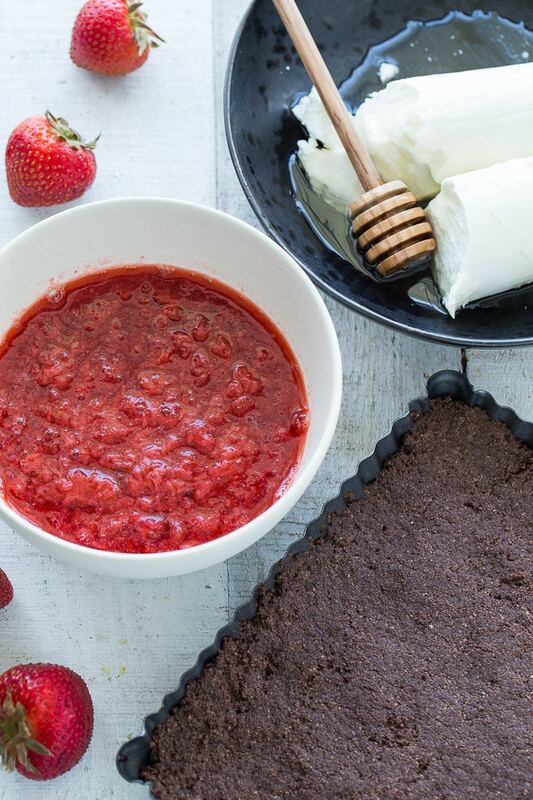 We’re talking sweet and tangy strawberry goat cheese filling meets baked cocoa almond crust! These beauties are perfect to make ahead and store in the freezer for easy summer entertaining or to satisfy that sweet treat craving! Is there anything better than a frozen treat on a warm summer day? I’m really hoping you all agree, because I’m sharing another frozen dessert today – these Frozen Strawberry Goat Cheese Bars! 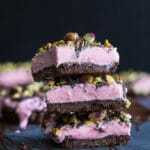 It’s been hot and humid here all week, so I’ve been busy consuming my weight in raspberry nice cream pops and these frozen strawberry goat cheese bars. No judgment please, it’s summer! Besides, when you recipe test as much as I do, you have a freezer full of frozen treats that must be enjoyed. Unlike nice cream, these Frozen Strawberry Goat Cheese Bars are not dairy-free, but thankfully, goat cheese is a dairy product I can enjoy. And lucky day, it works perfectly in frozen desserts! Last summer, I shared these Frozen Blackberry Goat Cheese Chocolate Bombs, and if you haven’t made them yet, I highly recommend it. The combo of mashed berries, goat cheese and honey makes a delightfully sweet and tangy filling. And when you pair it with chocolate, it’s just the best thing ever! So when I recently picked up some fresh local strawberries, I knew I had to make another frozen goat cheese dessert! And after a few variations, these Frozen Strawberry Goat Cheese Bars came to be. While these bars are easy to make, they require a bit of time to freeze, so I suggest making them in advance of any gathering – the day before would be perfect. I used strawberries in this recipe, but I’m thinking raspberries, blueberries or blackberries would work beautifully too. The chocolate drizzle and crushed pistachios on top are totally optional, but as always, highly recommended. I love the crunch it adds to these bars! That’s it! This one is an easy frozen dessert to help beat the summer heat! 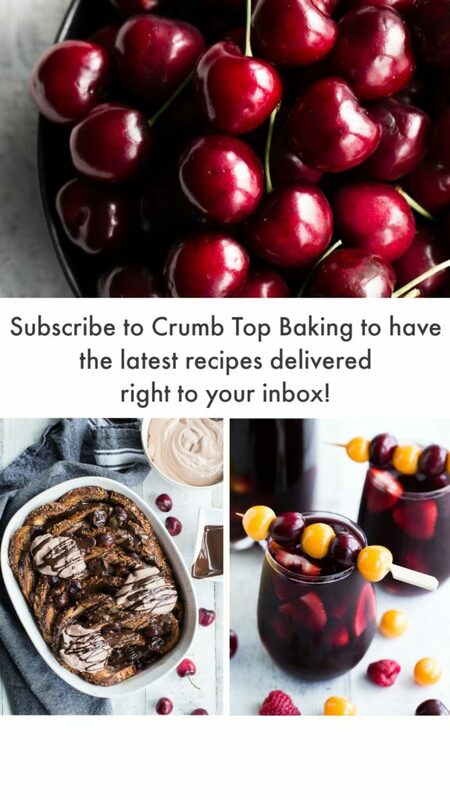 If you make it, I would love to know what you think in the comments below, or take a photo and share it on Instagram by tagging @crumbtopbaking! 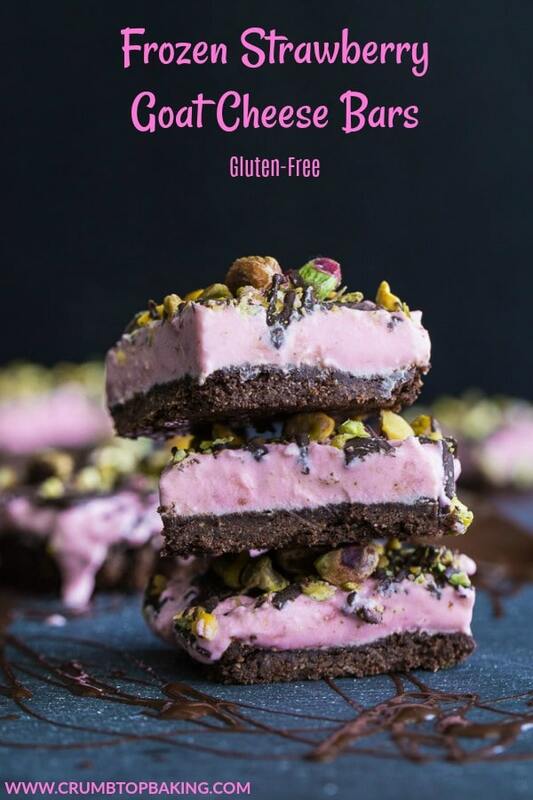 Frozen Strawberry Goat Cheese Bars are gluten-free with a sweet and tangy strawberry goat cheese filling nestled on top of a baked cocoa almond crust! Pre-heat oven to 350 degrees and grease a 8″x 8″ square tart pan. Press the mixture into the bottom of the prepared tart pan and bake for 10-12 minutes. 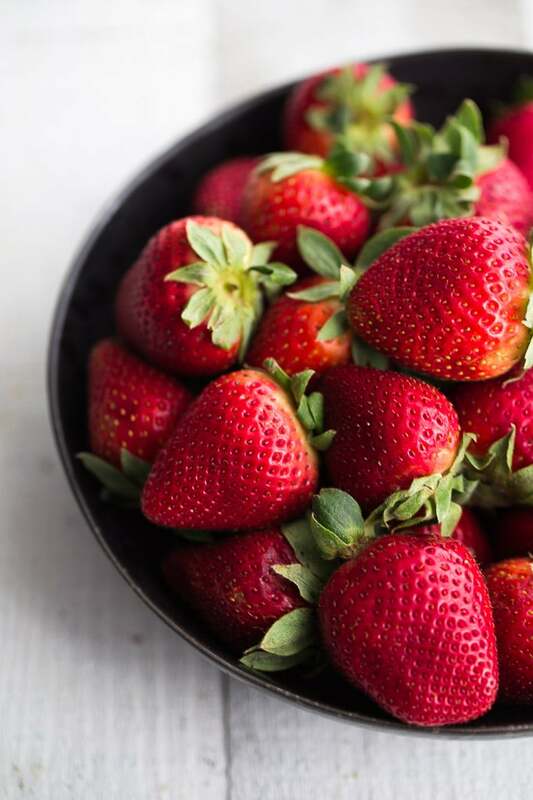 In a medium-sized sauce pan, add the strawberries and simmer on low heat for 10-15 minutes, until strawberries have softened. Remove from heat and mash with a fork. The strawberries will be a little watery. Set aside to cool. In a large mixing bowl, add the goat cheese, honey and vanilla. Using an electric mixer, mix on high until smooth and creamy. Add in the strawberries and mix on high until well combined. Pour the filling onto the crust and place in the freezer for 3-4 hours, or until frozen. In a small microwaveable bowl, add the chocolate chips and coconut oil and microwave for 30 seconds. Remove and stir until smooth. Drizzle over the frozen bars, and immediately sprinkle on the crushed pistachios. 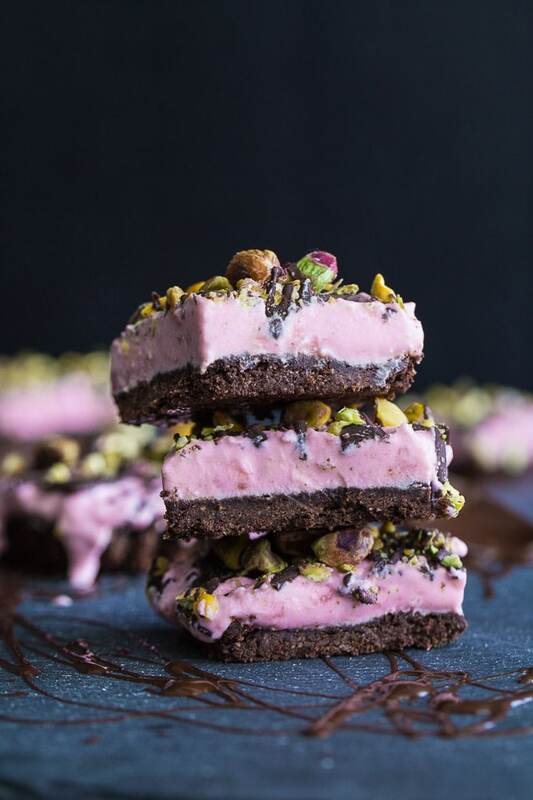 The chocolate sets quickly on the frozen bars, so if you wait too long to add the pistachios they will not stick to the bars. Return to the freezer for a few minutes to let the chocolate set. Remove from freezer and let sit at room temperature for 5-10 minutes before cutting into bars. Store any leftover bars in an airtight container in the freezer. Before enjoying a leftover bar, let it sit at room temperature for a few minutes so it softens slightly. Thanks Dawn! The goat cheese really makes these bars creamy, and adds a tangy taste too. And I should know. I’ve “taste tested” quite a few lately! And yes, fingers crossed we get another beautiful weekend like last weekend! Hope you’re having a great week! OMGgggg yum!! Loving the combination of flavours and that gorgeous pink colour!! Can’t wait to try these out this summer – have a fab week! Thanks Jessica! Yes, the strawberries created a lovely light pink colour! I hope you get a chance to try these during the summer. Would love to know what you think if you do! OH WOW Leanne these bars look so beautiful and the recipe sounds amazing. I am absolutely loving the colours and flavours in this recipe. What a stunning summertime treat! Thanks so much Ashika! Summer fruit always has a lovely colour, and the strawberries didn’t disappoint in this recipe! These bars look beautiful and sound delectable. Great flavour combo, and no, leaving out the topping for me. (Why would you??) Thanks for sharing, Leanne! Haha! Thanks Colleen. I always like to give the option of leaving out a topping (which is usually melted chocolate). But I’m with you! I never leave off a topping. That’s often the best part of a dessert! I am DEFINITELY making these, Leanne!! I love the goat cheese – it’s something I always have in the fridge. These are perfect as a sweet little summer treat for the fam! The color on these is so amazing! Makes me want to make them asap so I can give them a try. I do need this in my life! I love goat cheese and this is such a good use of it. This color is magnificent. Thanks Patrick! I always go for goat cheese in savoury dishes, but it works so well in desserts too! I love sweet and savory so that filling is calling my name! I’m so intrigued with the crust too. I’m steering clear of flour these days so I’m loving that the crust is simply almonds, coconut oil and cocoa powder. These look just delicious Leanne! Thanks Marcie! This is a crust I’ve used in a few different recipes. It’s a perfect alternative to a flour-based crust, and it’s not overly sweet, which I like! Hope you find a reason to give it a try! This is the perfect summer dessert recipe! Great for a summer get together. And those pictures are amazing by the way! Thanks Kelsie! For me, the dark chocolate is always a must! And yes, the pistachios add a nice crunch, especially when you eat the bars right out of the freezer! Yum!! I have never used goat cheese in a dessert recipe before, and I bet the tang is yummy!! I could definitely use a frozen treat right now….we are in the middle of a heat wave. Thanks Kelly! It’s been pretty hot here this week, so I’ve been enjoying some of these bars! Goat cheese does add a tang to desserts, but when you pair it with some honey and fruit, it is a nice balance of flavours! What a pretty treat this one is! That pink color…Omg! With all that decadent chocolate and pistachios for some texture contrast. I want them all. Thanks Neha! It’s hard to eat just one! And I agree. I love adding pistachios as a topping because of their colour and texture! Leanne! What an amazing summertime treat for all of us who are gluten-free! I’ll bet it would be great with blueberries, too! Thanks Elaine! I definitely want to try these with other berries. Blueberries and raspberries are at the top of my list! How pretty are these Leanne?! And those flavors! 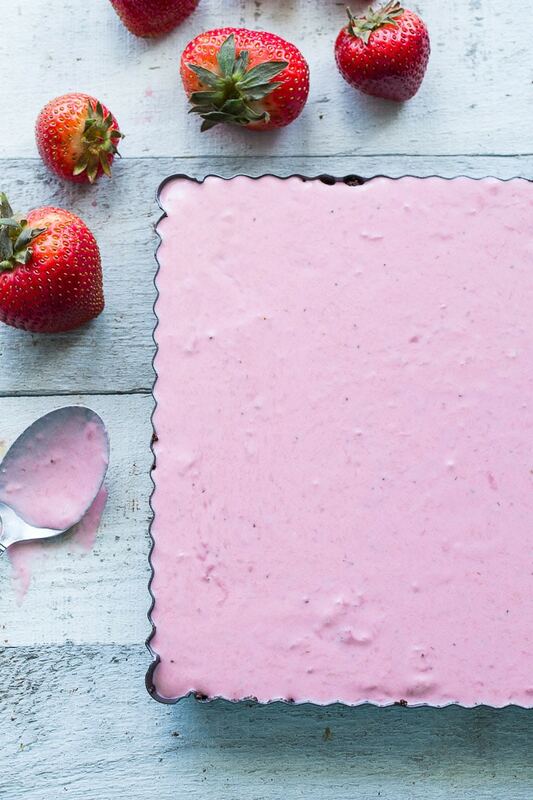 Nothing beats summer strawberry desserts! So perfect for the heat wave we’ve been having! Thanks Mary Ann! Strawberry desserts are pretty awesome! And they’ve been perfect for our little heat wave too! Oh so yummy! I made these but substituted raspberries for the strawberries oh so good. My husband even likes them he couldn’t believe they were made with goat cheese. A great treat when your trying to avoid the heavy sweet treats. Thanks so much Doreen! I’m so happy you and your husband liked them! And I definitely need to try them with raspberries! These look soooo amazing for summer! I bet I could eat the whole pan…goat cheese, dark chocolate, nuts and berries sounds so divine all together! YUMMY!! so nice and yummy. I am loving it.